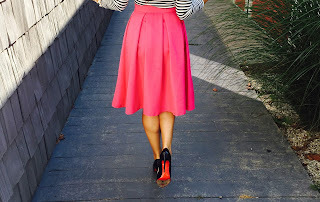 Pin Money: Feminine Touches: Polka Dots and Bows! Happy Wednesday Pin Money girls! There is something so simple yet sophisticated about polka dots and bows. At any age, this style just works. Today- I threw my hair in a sock bun, and paired my new Forever 21 polka dot top with a bow belt, red ankle pants, and sling back bow shoes. I love this top because it is so transitional- it can be paired with colored ankle pants, jeans, or skirts. The look is simple, yet feminine and is a perfect go-to outfit for the office or for grabbing lunch with girlfriends.